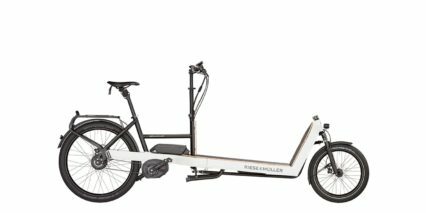 Riese & Müller designs and produces some of the coolest electric cargo bikes around, and the new Packster 40 is a spinoff of their larger Packster 60 and 80 model, which I reviewed in 2017. 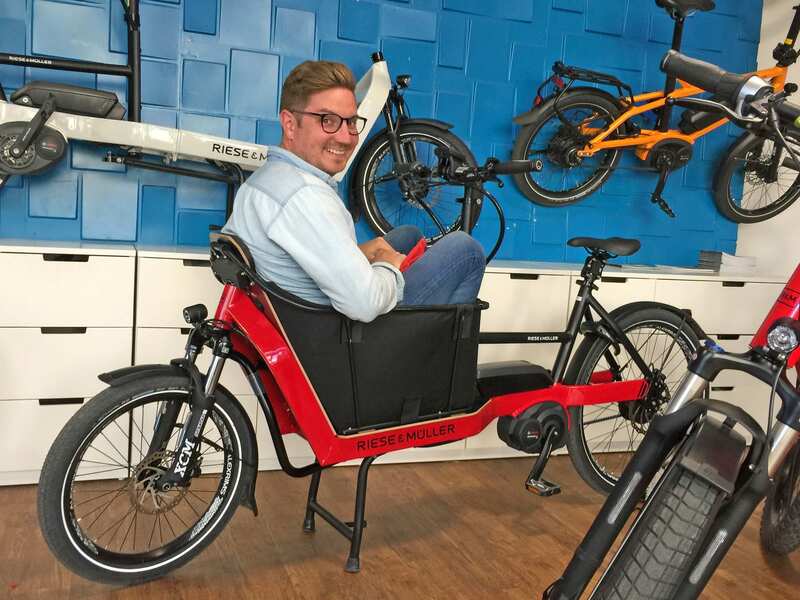 It’s a flexible platform that can move goods or additional passengers (just one in the case of the Packster 40), yet remains comfortable and compliant. 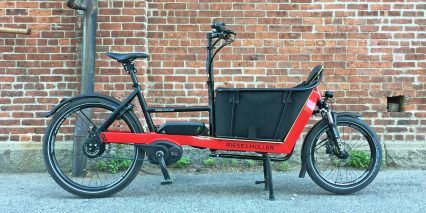 Many of the cheaper value-oriented electric cargo bikes I have tested and reviewed, such as the RadWagon, suffer from frame flex. This can lead to speed wobble depending on how weight is situated across the frame, and it doesn’t inspire confidence at high speed. The Packster 40, by contrast, feels rigid and nimble. 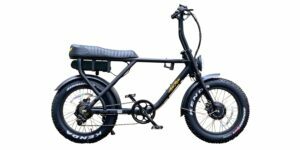 It can haul up to 350 lbs of cargo and is offered as a Class 1 20 mph ebike or Class 3 28 mph speed pedelec, which is well-suited to commuting. The front box options are a bit narrower than the Packster 60 and 80, which allows for steeper cornering, and the ground clearance is surprisingly good because the wheelbase is shorter. 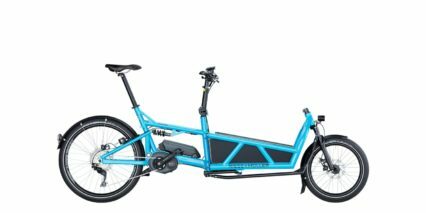 Additionally, the smaller 20″ front wheel and 26″ rear wheel bring the box and mid-section down low for easier loading and mounting of the bike. Measuring ~88 inches in length, it’s actually shorter than the full-suspension R&M Load model, which has a wider box that can fit two children facing forward. 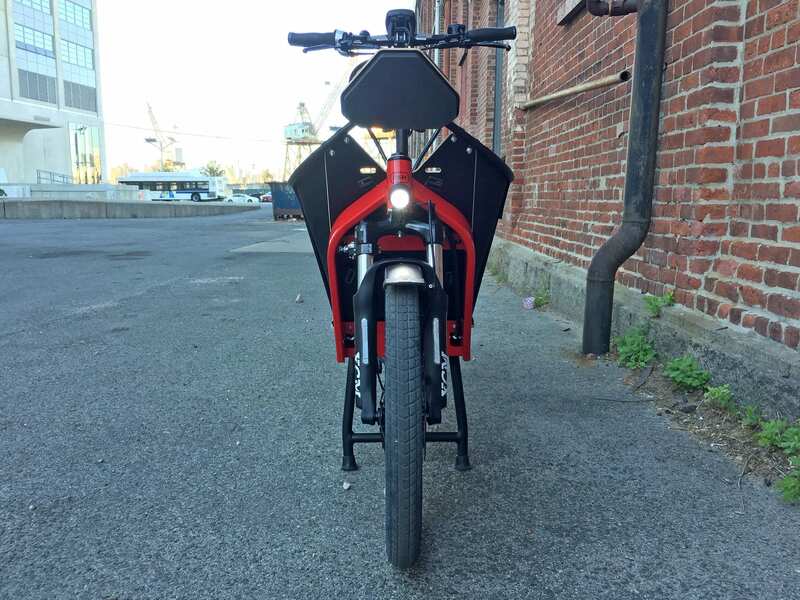 The Packster 40 takes a different approach, allowing for one small passenger to face backwards, towards the rider. It’s an intimate experience, and one I got to experiment with first hand with the help of Chris Nolte, the owner of Propel Bikes in Brooklyn. 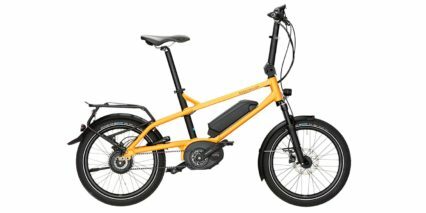 With the sturdy double-leg kickstand deployed, the bike feels very stable and is easy to climb into. 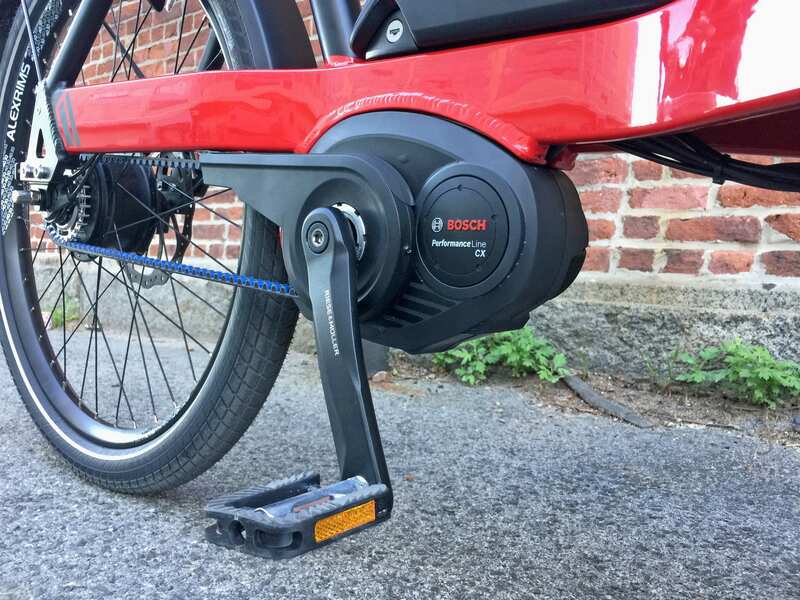 From there, pushing off and pedaling the 75+ lb bike forward is easy with motor assistance from the Bosch Performance Line motor. 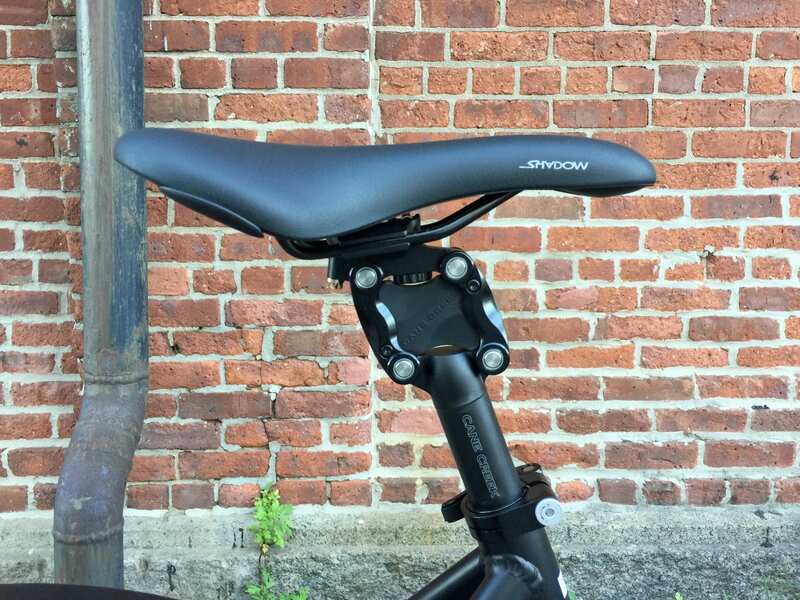 As someone with a sensitive back and neck, I deeply appreciated the 70 mm suspension fork and Thudbuster ST suspension seat post. 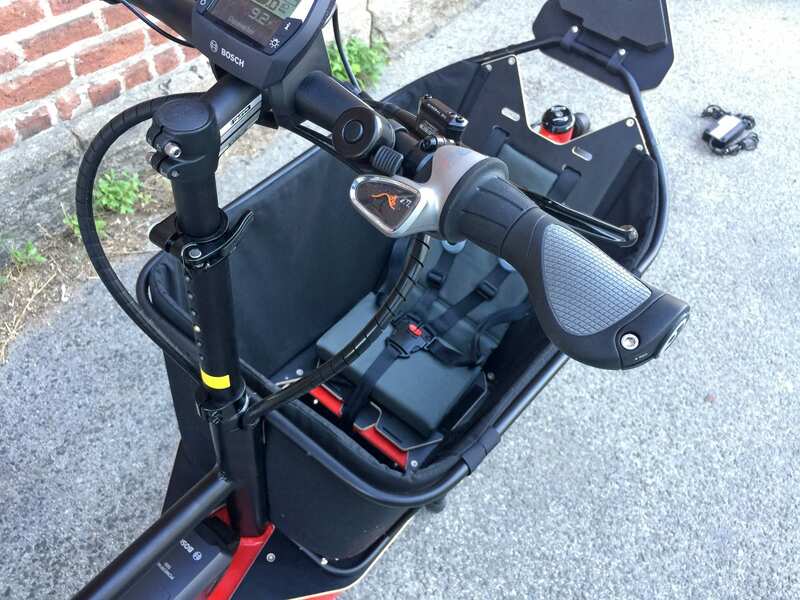 Whether you’re a petite rider, or someone with long legs and arms, the Packster can be adjusted to suite your body comfortable because the seat post goes up and back while the handlebars go up into six locking points. 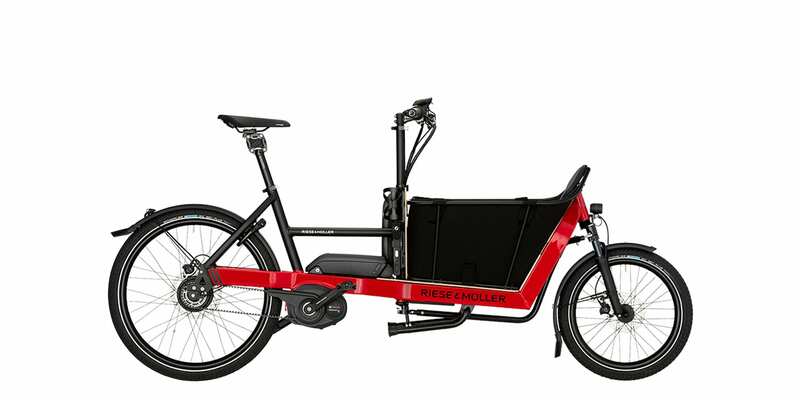 You do pay for the quality German engineering on this product, but you get excellent dealer support and a leading drive system with options to upgrade battery capacity and double range, accessorize with racks, and optimize for a range of utilitarian or family activities. 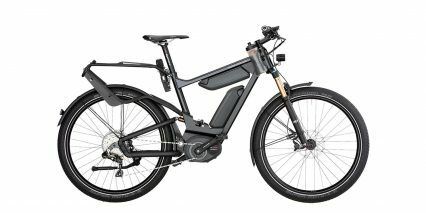 Driving this bike is one of two Bosch mid-drive motors. Both are designed to measure your rear wheel speed, pedal cadence, and pedal torque, 1,000+ times per second. Both offer shift detection, and both use a smaller proprietary chainring that spins 2.5x for each crank arm revolution. 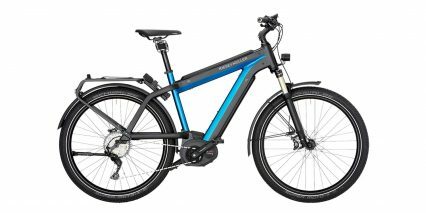 This is one of the most celebrated motors in the ebike space globally, it’s known for being reliable, and can support up to 120 RPM pedal rotations. 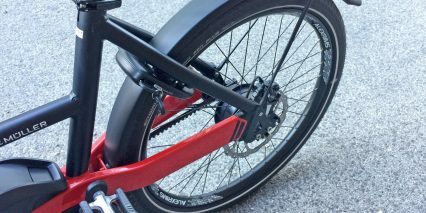 This means that you can simply pedal faster to make the bike go faster without having to shift gears as frequently. Some of the downsides I have noticed are that the motor weighs a bit more at ~8.8 lbs, can produce more noise at high power (kind of an electronic whining that you can hear in the video review above), and causes a bit of pedal friction when the motor is off and when you try to exceed the maximum assisted speed. That 2.5 reduction gearing setup translates your pedal strokes into more motion, which empowers the motor but creates a bit of drag for you. It’s a minor gripe, and some of the other benefits are improved responsiveness and chain retention. 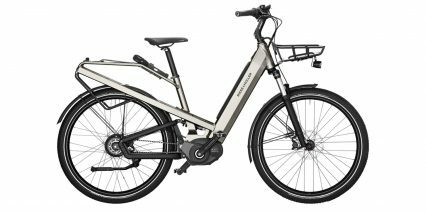 It’s a trade-off that Bosch has moved away from with their new Active Line motors, but those don’t offer the same power and torque as the CX and Speed motor options on offer here. 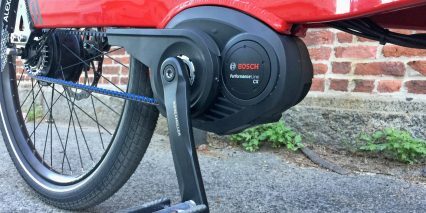 The demo model I tested for this specific review used the high-torque Bosch Performance Line CX motor, which offers 350 to 570 watts of power and up to 75 Newton meters of torque. 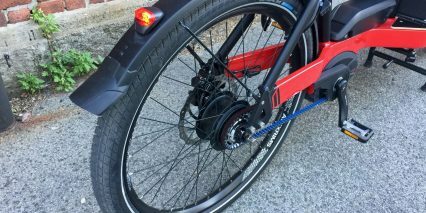 It’s extremely capable if you shift gears thoughtfully, and the demo bike I tested had a “shift anytime” NuVinci CVT drivetrain. Instead of using steps to change pedal cadence, it uses an “infinitely variable” ramp. Contained inside the rear hub are eight orbs that pivot and change input rotation to output speed as you twist the right half-grip shifter. 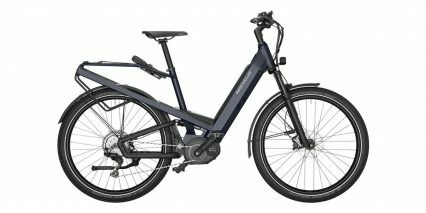 It’s extremely smooth and can be done at standstill (which is handy for such a heavy bike, in case you forget to shift down as you come to a stop), but this fancy system does add to the price and weight of the bike. 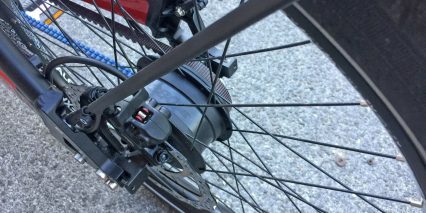 If you opt for the less-expensive Shimano Deore 10-speed drievetrain, you’ll get faster shifts but more banging as the chain jumps from one sprocket to the next, as well as more grease and noise. 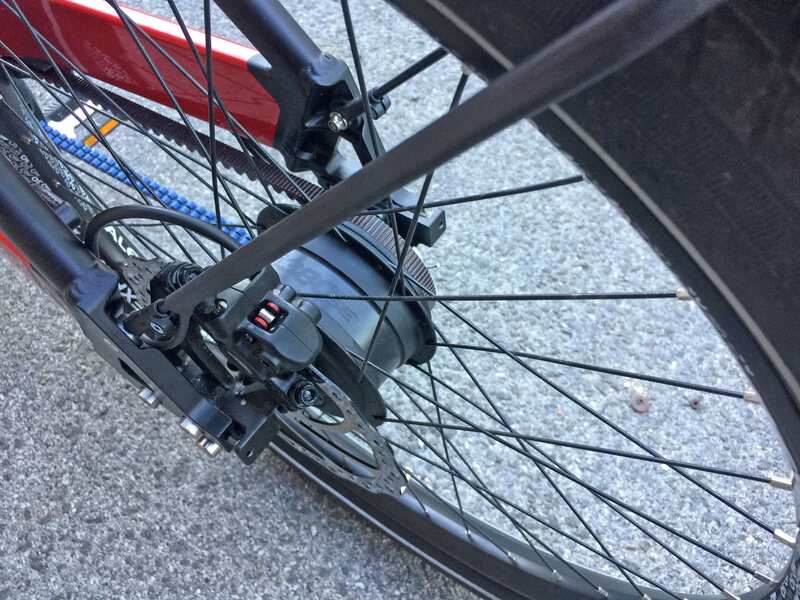 The NuVinci system comes with a belt drive setup that is clean, quiet, and set at a fixed length. In some ways, this makes the motor sound louder, but my experience (and feedback from shops) is that the belts require less maintenance over time and rarely fall off because of a center-tracking design that Gates has patented. 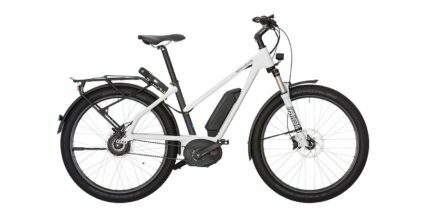 Powering this bike is one or two Bosch Powerpack 500 batteries. I love this product because it’s compact, relatively lightweight, has an integrated 5-LED charge readout on the left, and a big loop handle at the top. 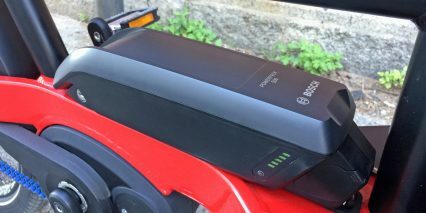 These Lithium-ion batteries are not cheap, and if you drop it (or decide to get a second battery to extend range on the Packster 40) it will cost you upwards of $900! 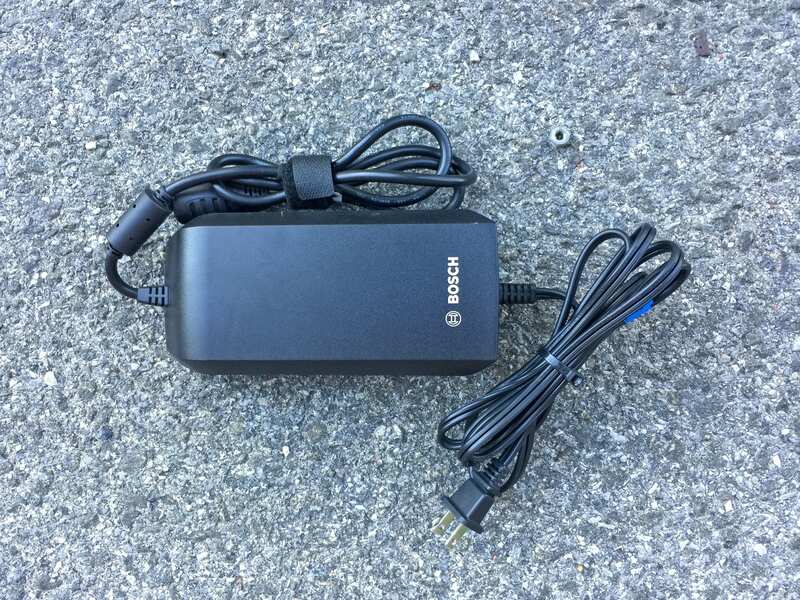 And, I believe you have to decide on a second pack at the time of purchase in order to get the second docking point (which mounts to the back left side of the box). Oh yeah, and you’ll need to order the box or carry system for $164 or $218 respectively. Design wise, there’s not a lot to complain about with any of the Riese & Müller products, so I’m going to take this opportunity to say that it would be nice if they just included one of the box/carry options by default. Maybe that would increase the MSRP and be wasteful for some riders? I guess I enjoy choice… and that is a big part of the R&M philosophy. All of their products are built to order, it’s how they are able to offer so many accessory and build options, but it can take over a month to fulfill once an order has been placed (especially in the United States). 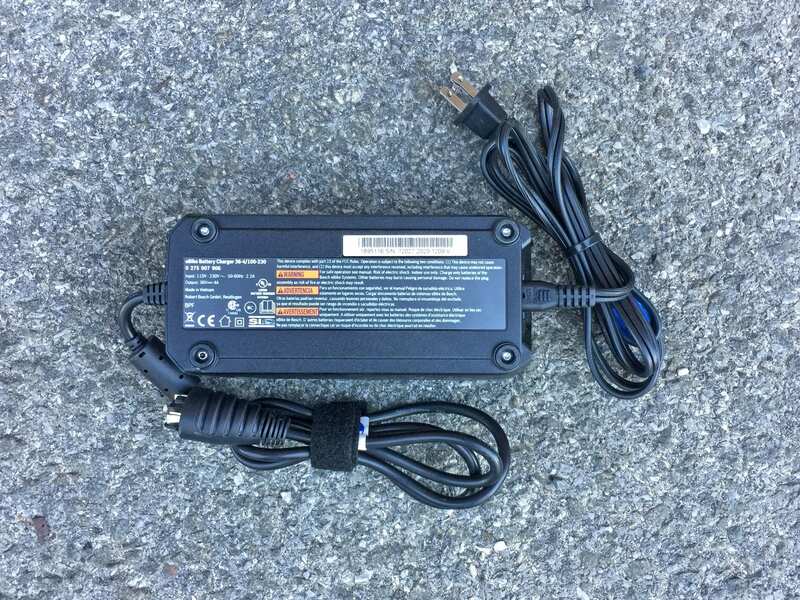 The good news however, is that you know that you’re getting the latest and greatest hardware (as they make iterative improvements throughout the year) and your battery pack won’t have been sitting in a warehouse for an extended period of time. These packs should last well over 1,000 full charge cycles and can be cared for by storing in a cool, dry location. 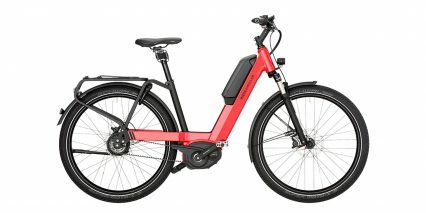 If you opt for the second battery option, for a 1 kilowatt hour capacity, you can fill both packs at once by plugging the fast 4 Amp charger into the bike. 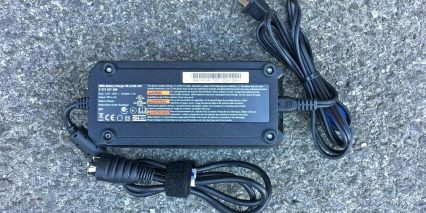 If you take the batteries off however, they will need to be plugged in independently. 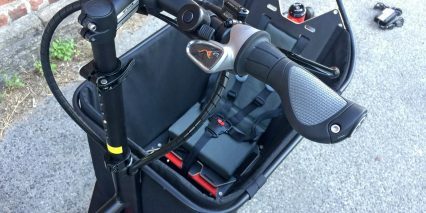 If you opt for the box or carry system, there’s a spot for mounting a bottle cage and folding lock on the right side that sort of balances out the second battery, which would be mounted to the left. 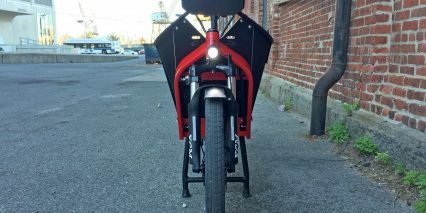 The first default battery is mounted low and center on the frame, below the short top tube for protection. I love that the pack has been pointed backwards, in order to position the charging port clear of the right crank arm. 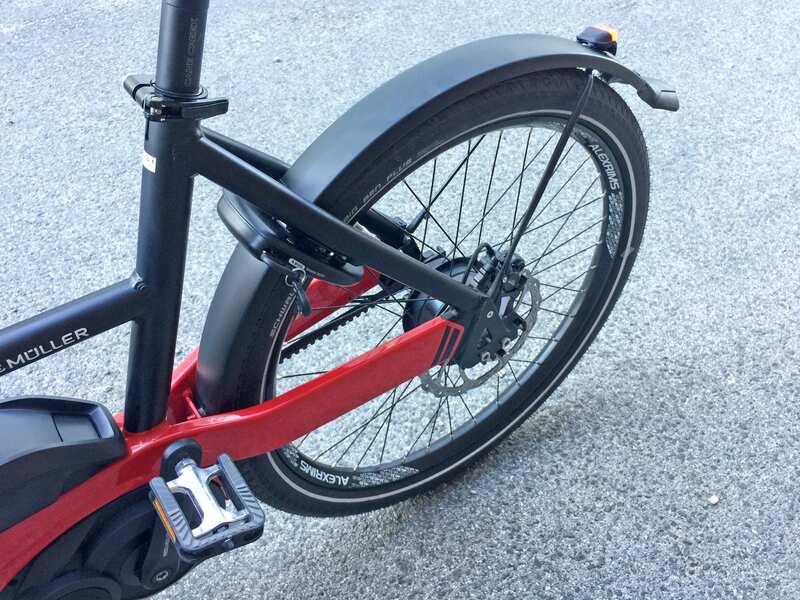 There are so many little design considerations that have been maximized here, such as the included ABUS frame lock that immobilizes the back wheel. It uses the same key as the battery locking core so you don’t have to deal with clutter and lost or confused keys. 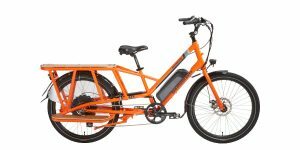 Operating this electric bike is very straightforward. Once the battery pack (or packs) have been filled and mounted securely to the frame, you simply press the power button at the lower left corner of the large, Bosch Intuvia display panel. This display is awesome! 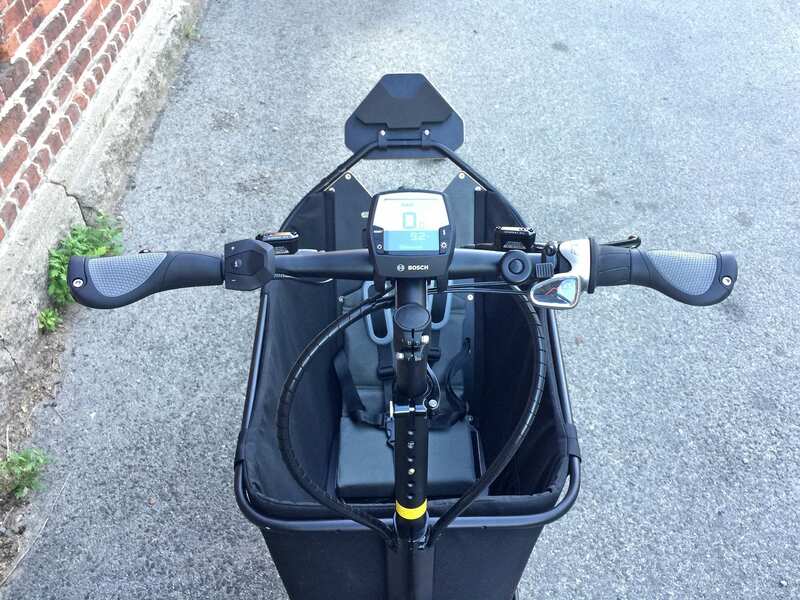 It can be taken off the bike for safe keeping if you commute (just like the batteries) and has a little Micro-USB port on the right edge for filling your phone on the go. That’s a really convenient feature if you’re a delivery person who uses GPS to get around. 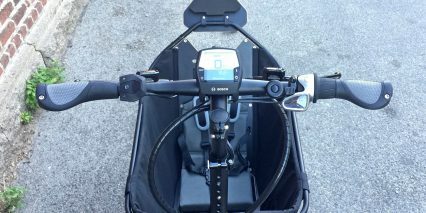 The display pivots to help you reduce glare, it has an always-on light glow so you can read it at night, and the most common input buttons are externalized near the left grip, so you can interact while riding without compromising steering and balance. So, the display blinks to life quickly when you press the power button and then shows a five-bar battery infographic, your current speed in the middle, and a list of assist levels with a dynamic power chart on the right. 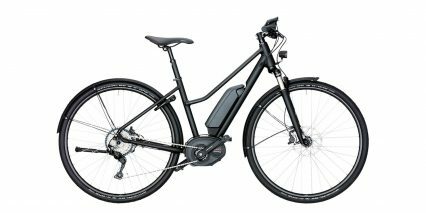 If you get the Bosch CX motor, those assist levels will be off, eco, tour, eMTB, and turbo. 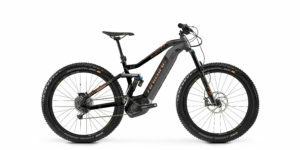 The eMTB mode is special, and works more like a torque sensor with full-range output. If you arrow up to this mode, using the left button pad + and – buttons, it allows to motor to offer between 130% and 300% assist power. 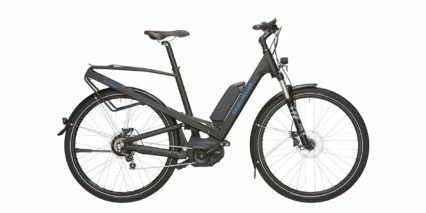 By contrast, the Bosch Performance Line Speed motor has a sport mode instead of eMTB which offers a set 210% output. 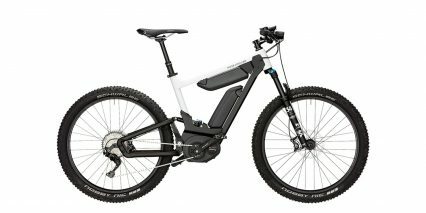 Each of these four modes still relies on pedal torque to determine how much power is set… but it’s kind of nice to have that extra torque and range of power with the CX motor and eMTB mode for a cargo application. It allows you to balance the bike realtime by working with the motor instead of reacting the to the motor, if that makes sense. I thoroughly enjoyed the CX motor on this ebike, and tend to go for slightly lower speeds when navigating with cargo or kids, but could definitely see myself feeling comfortable with the Speed option. So anyway, the other readouts on the display are listed below the speed number and can be changed by pressing the i button on the right side of the the display as well as with the rubberized i button on the control pad. These menus include average speed, max speed, trip distance, odometer, timer, and range. 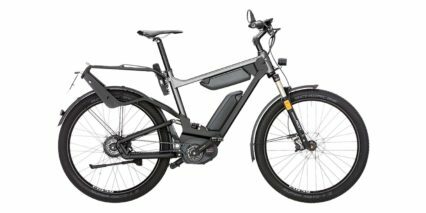 Range is way more useful than the 20% battery bar increments, and they update dynamically based on your last mile of riding, the battery charge level, and the currently selected assist level. 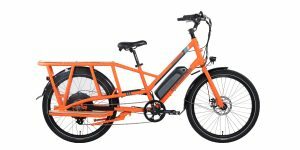 Let me tell you, it’s not fun to run out of electric assist with a full load of cargo… so use the range selector to plan accordingly and consider bringing the battery charger along so you can do a quick top-off if necessary. 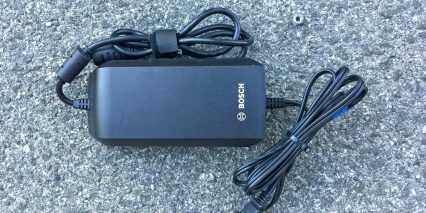 Bosch does offer a slower but lighter and smaller travel charger that puts out 2 Amps. That could be a nice extra to bring along? 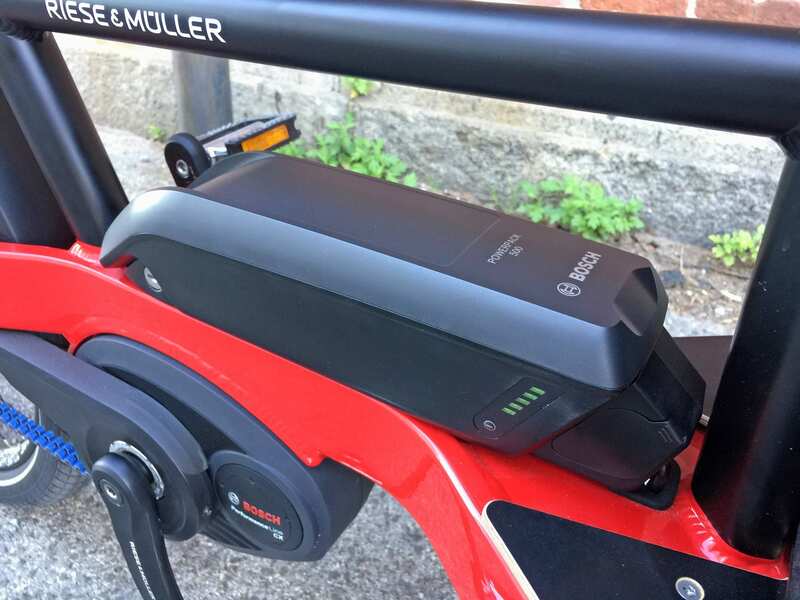 Another cool feature that Riese & Müller enabled for their ebikes is walk mode. This can be useful if you have to cross sand, get a flat tire, or are walking through a crowded area where riding simply isn’t appropriate. 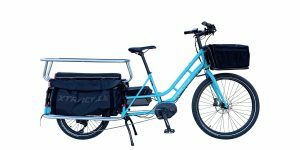 Again, this is a heavier and larger bike, but it’s definitely more maneuverable than a lot of the competing cargo products I see and review. There’s a lot to appreciate with all of the Riese & Müller products but the Packster 40 really made me smile. 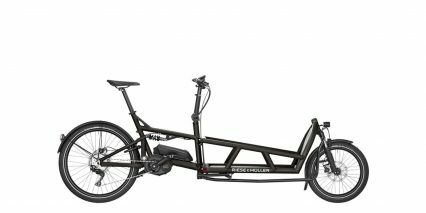 The front cargo box option has a swivel-up headrest thing that offers some comfort as well as a pass-through viewing of the front wheel. 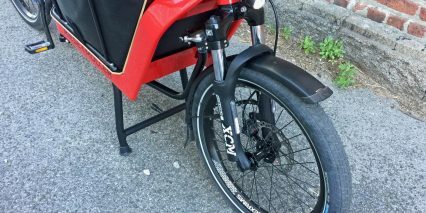 being able to see the wheel turn improves confidence… and I love that both wheels have extra-wide fenders to keep the cargo and you dry. 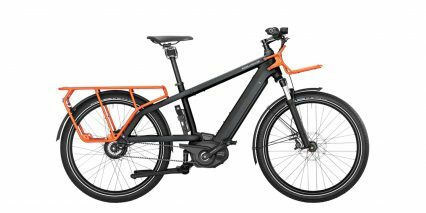 The chainring has a plastic cover, the tires are reflective for safer night riding, and the integrated lights are larger than most, with the headlight offering 165 lumens, pointing where you steer, and being sprung above the suspension fork vs. on it (which can be bouncy). The headlight is also slightly higher in this position, so the beam isn’t obstructed by the front fender, and the Aluminum alloy housing is much tougher. It’s great to have lights that don’t require disposable cells and additional button clicks to activate and de-activate each time you go out riding. I also appreciate the locking Ergon grips, which reduce wrist nerve sensitivity, and the basic flick bell for friendly signaling. 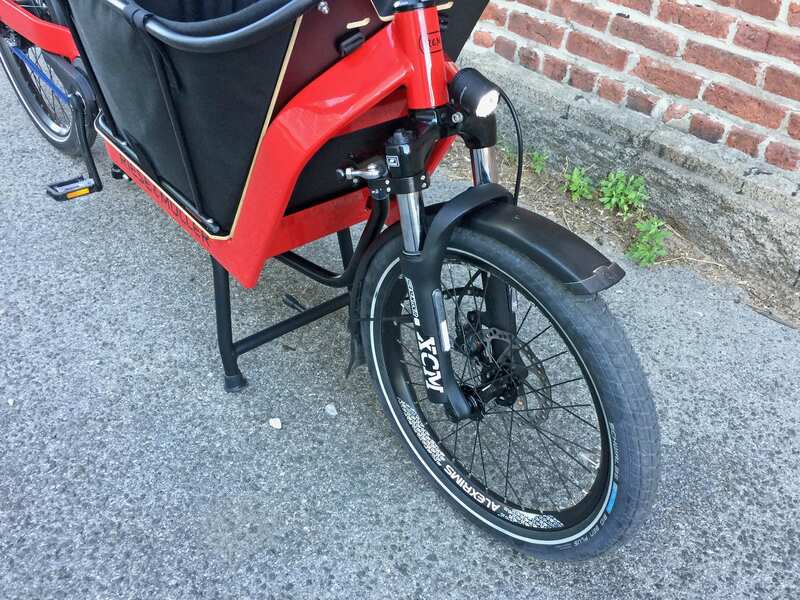 Even though this electric cargo bike does not have a throttle, I have found that the Bosch motors are fast to respond and powerful enough that my knees never felt sensitive… and being Class 1 and Class 3, the bike is legally allowed in more places, like New York City. 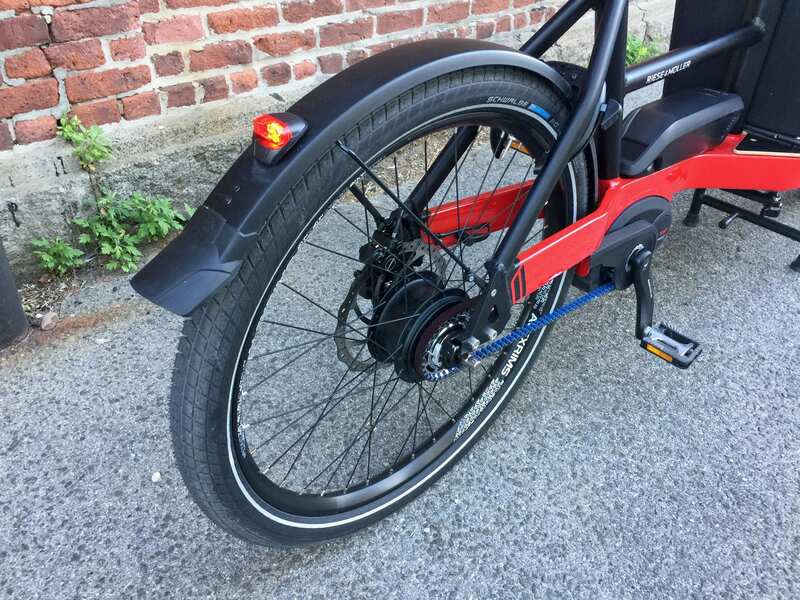 Neither wheel is secured with quick release skewers, so changing flats will take longer, but the axles are thicker and stiffer, and you won’t have to worry about theft of wheels as much. 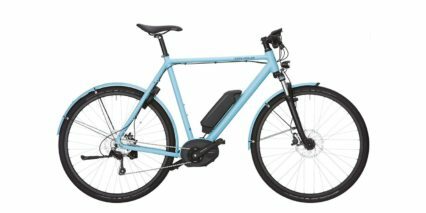 The seat post does use quick release, so I’d suggest getting a folding lock and using the keyed-alike program from ABUS so you can use the same key for all locks and batteries… and I might use a seat post leash to secure the saddle and post, since they are nicer. The final word of caution I’d like to share is that if a child is riding in the front box and holds onto the sides of the box, their fingers could be vulnerable if you scrape a wall or railing. Just keep an eye out or have a “hands inside” policy. 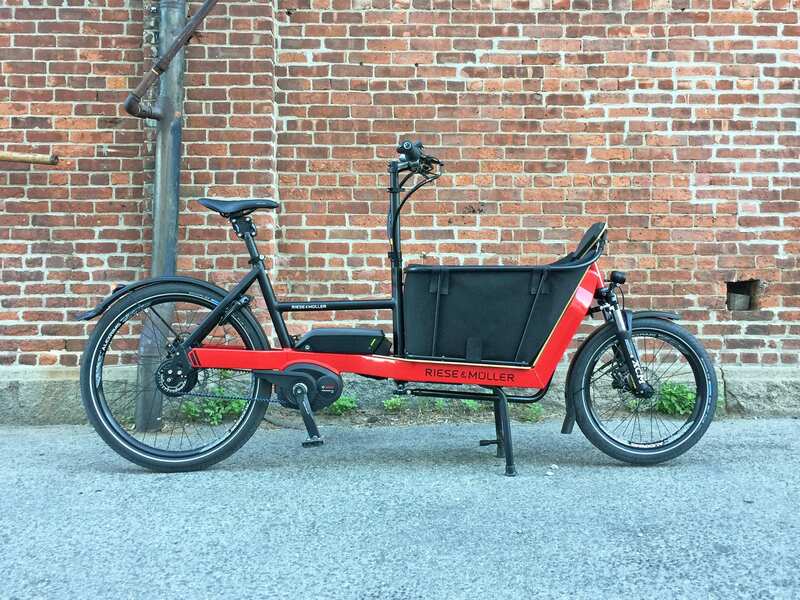 There are some full-surround tubing options for many rear cargo bike racks that have two tubes (one to hold and one to protect) but that’s just not the case on this bike. 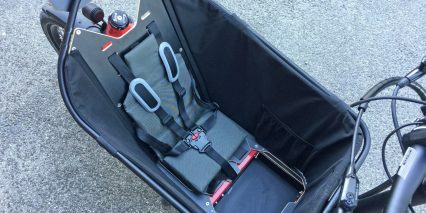 Thankfully, the padded seat with recessed foot position and multi-point harness should keep them comfortable and seated. I thought the “glove compartment” space was another really clever design here, allowing the padded seat to fold down into the base of the cargo box, allowing for protection and an even loading surface when you transition from hauling people to gear. 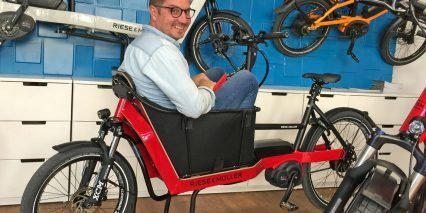 Big thanks to Riese & Müller for partnering with me on this post, and Chris at Propel for bringing out several bikes to test and explore back to back. 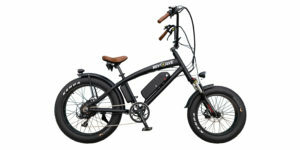 I will do my best to answer comments and questions below as well as the Riese & Müller electric bike forums. The Bosch Intuvia display panel is one of my favorite systems on the market because it’s easy to interact with while holding the grips (by using the control pad near the left grip) and the LCD is large and easy to read, removable, and has a Micro-USB port built into the right side to maintain your phone or other portable electronics while riding! 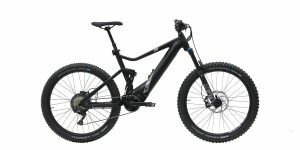 Minor gripe here, the suspension fork just has two preload clickers (that must be adjusted to match each other), it would be nice to have lockout and possibly rebound adjustment as well to reduce bouncing or maybe just an easier way to adjust preload so you can quickly make changes when loading and unloading weight? Hi, very interested to hear about the new 40 cm model. 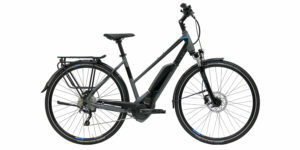 Some European reviewers noted issues regarding the front suspension fork on earlier models of the Packster. The coating on the inner fork tubes was wearing away, and the fork leg slider bushings were getting loose. Apparently sideways forces were overloading the fork at the slider interface. Perhaps the fork R+M used was a bit taxed on a cargo bike. In your video, you noted the Packster 40 had a thru bolt front fork. Do you know if R+M upgraded the front forks on the Packsters for 2018? I’d think a thru bolt would help strengthen the fork and wheel combo quite a bit. I can now see in your high res photos that R+M has chosen a front fork with chrome-plated stanchion tubes on the new models – which should address part of the reported issue. 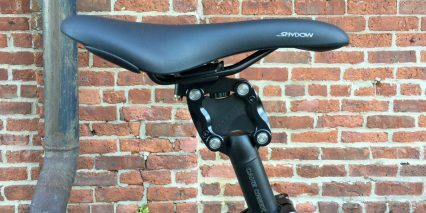 In your photos, the fork brace and crown look a little beefier on the new fork. With the thru-bolting, I’d think R+M has shown a commitment to solve any issue. I’ve only heard of a very few issues with the Packster/Load. Everyone loves them. Only other concern I saw reported is the height of the child’s canopy, which some feel is a little low for the US market, where most children wear helmets. 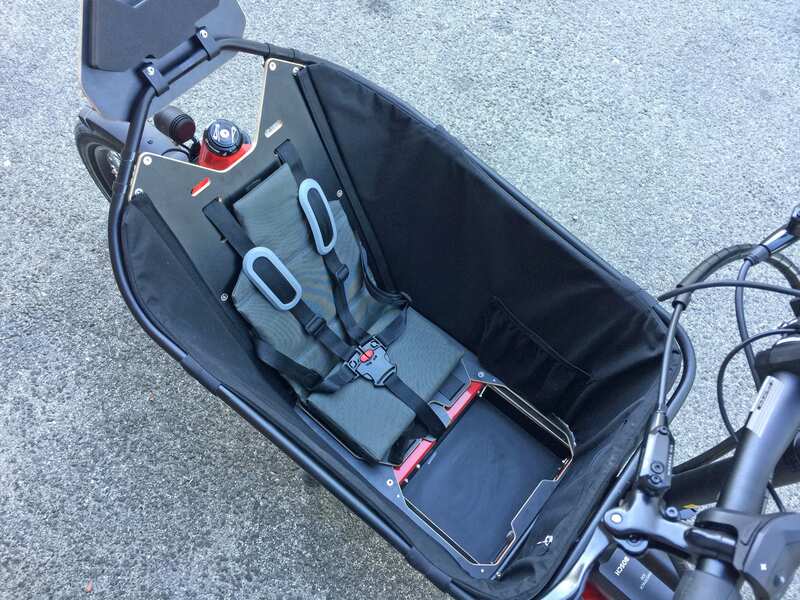 The child’s canopy was also reported to activate the brake, which shut off the motor power in tight, low speed turns – resulting in dumping the bike. The reviewer reported that issue was solved with a BlaqPaks canopy. Researching these for my daughter. Your reviews and website with high res photos are so very, very helpful! Thank you for an excellent and detailed review. 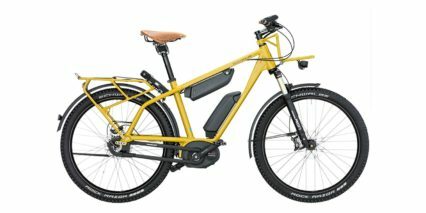 I found it very helpful as I was researching these bikes. In fact I just ordered one! A small point: You note as one of your cons for the bike that there is “some friction produced which adds work when pedaling unassisted or above the max assisted speeds”, and that this was due to the extra fast revolutions of the motor and chain ring. My understanding is that the added friction is because of the choice of **Nuvinci gearing** that is not present with the other drivetrain option. I am no expert on this, but I did try both drivetrain versions here in Oslo, Norway. 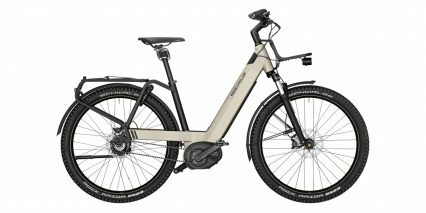 I noticed the NuVinci seemed a bit heavy to pedal above the motor assist speed, and was told in the shop that there is about 15% (or was it 10-15%?) power loss with the NuVinci gear and that this is indeed noticeable. This is one of the reasons I chose the more traditional gear system, as I see myself sometimes going above 25 km on flat ground (limit on assist here in Europe). Also, there is a drop in battery range for the NuVinci, presumably in the same range. So I think this extra friction should be added on the con side of NuVinci drivetrain and gearing system, not of the bike or the Bosch motor system. I don’t mean to imply that NuVinci is a bad choice. As you note, there are clearly some significant pros also to that innovative system. I would say it depends on your intended use, biking style, previous experience and personal preference (and wallet). 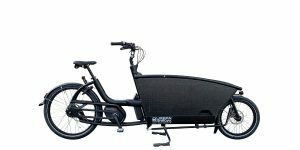 Happily, at least as I write this, the bike is available same day or next day from my shop in Oslo, in several configurations . I think they pre order a few standard configuration bikes from the manufacturer and keep a small stock. Thanks again, very helpful review.